Investment casting companies are known for making high quality products for their clients who come from a wide range of industries and sectors of the economy. Industries such as automotive, sporting goods, hardware industries and many others choose investment casting over other processes. So why do they choose an almost ancient process? In this article we will take a look at a few alternative processes and compare them to the investment casting process. Let’s consider the manufacturing process of making a hammer. Now it would be possible to make a hammer out of a solid chunk of metal, but this process would be incredibly wasteful as a majority of the metal would turn into scrap during the machining process. Not to mention this approach would be far too time consuming and labor intensive, so we can cross machining off our list of potential processes. Forging would be a much more appropriate solution for manufacturing a hammer, however there are still some drawbacks to using forging as a way to manufacture hammers. Though the forging process directional stress could be a consequence of the process and damage the final product, not to mention that the tooling cost for forging can be much higher than that of investment casting. So that leaves us with die casting, surely this process will be better than forging and machining, and it is. The issue is that the die casting tooling process also costs a considerable amount more than investment casting and maintaining the die casting machines can be pretty expensive. Finally, let’s talk about investment casting. This process is far more attractive than the other processes mentioned because it creates a product that has high quality surface finishes and it comes at a lower cost. The products made from investment casting are highly accurate and can be very complex, all while remaining consistent from piece to piece. If you have any further questions please contact us today and we would be happy to provide you with more information on our investment casting process. As one of the oldest forms of casting in the world, investment casting has been used long before the industrial revolution or modern factories were in place. Ancient civilizations used this technique centuries ago; the fact that this method is still used today goes to show that investment casting as process has proven time and time again that it is one of the best processes out there. The origin of investment casting dates back around 5,000 years ago when these civilizations made casts from beeswax. The overall process was similar to what we use today with only minor differences; they would create the cast from beeswax using hot tools, melted wax and a variety of shaving tools in order to achieve the right shape. From there the craftsman would add layers of ceramic and wax to create a mold based on the original wax shape. This mold would be used to create metal objects such as jewelry, religious objects or simply decorative pieces. Today, the process of investment casting is very similar with the only difference being the tools and materials that are used. Molds can be made from rubbers, ceramic, metal or woods and even the final products can be a variety of different alloys or metals. 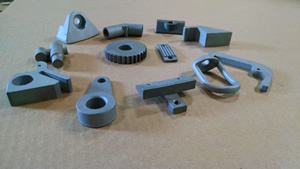 So many of our common products are made from an investment casting process and have been for years, which goes to show that investment casting will be a solid foundation of civilization for years to come just as it has been in years past. Metal casting has been around for years and there are multiple ways to go about the process from die casting and permanent mold casting to investment casting. Metal casting simply refers to the process in which a metal product is formed using a mold or cast. Heated liquid metal is poured into these molds where it cools and hardens into the final desired product. Investment casting is the same process, except the mold is destroyed during the process. The liquid metal is poured into a cast where it cools and hardens, and then the cast is broken off of the final product in a way that preserves the product inside. This means that each mold is only good for one final product as it cannot be used more than once. Obviously this is not the most efficient process if you are looking for mass production; however investment casting allows metal workers to create some of the most intricate and complicatedly designed products that are impossible to make with other process. Products made through the aluminum investment casting process are all around us, so much so that we might not even notice them. They are found in a number of different industries from the aerospace industry to complex piping solutions. 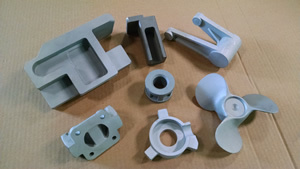 Aluminum investment casting is great for application that require low weight yet strong materials, as this process can yield extremely thin, yet strong, aluminum. Investment casting is the process in which hot, melted metal is poured into a cast mold in order to create a product or part. This is considered to be one of the most reliable methods that is used to form detailed parts and will often be used to create delicate machine parts. Precision casting is used when basic investment casting is not the right process for the job. Aided by computers, precision casting offers a process in which the most detailed and intricate parts and pieces can be made. Customization: Both precision and investment casting allow for complete customization of a part. Once the customer submits a prototype of the part, the investment casting manufacturer is able to create an exact replica cast down to the very last detail. Accuracy: High-quality pieces are what set investment casting apart for other processes. Parts that require a high attention to detail and accuracy are often made through precision casting in order to ensure that each piece is made in the best possible way that will have no problems fitting in their application. Cost effective: Precise casting eliminates the need for virtually all other finishing processes such as grinding, machining, or polishing. This will cut your costs down, which turn results in your customers having to pay less for your product. This advantage in sales is enough to set your company apart from your competition. Labor and cost savings: Custom orders can be completed in just a few steps, and can set to a specific number of pieces per order. So you do not have to pay for more pieces than you need. This will cut down on order processing times and for smaller custom orders investment casting can often times be a much less expensive process compared to alternatives. There are a number of different methods available for stainless steel manufacturing, so many so that it is a bit surprising that investment casting is still considered a viable option. This method is one of the first forms of metalworking and takes more time than modern processes. First you need to make a mold of your product, then you make a wax cast of the product which is then used to make a ceramic mold of the product. This ceramic mold is then filled with the desired molten metal and left to harden. The ceramic mold is then broken off of the metal to reveal the final product. So if there are so many different quicker options, why would anyone decide to pick the time consuming and often costly investment casting procedure? The reasons are simple; there are more benefits to investment casting than other metal working techniques. The process may be from a thousand years ago, but many companies specifically use investment casting for the benefits that are provided. 3 of these benefits are listed below. Reduced machining time: Due to the fact that these molds result in what is basically the final product there is much less secondary machining and modifications that need to be done to the metal in order to get it up to the customers specifications after the molding process. This saves money in the long run as it cuts back on the time of the overall manufacturing process. Customizable lot size: Typically, investment casting is done one part at a time. This gives customers the option to make customized lot sizes instead of having to purchase more parts than they really need. This saves the manufacturing plant significantly more time and resources as they do not have to put working into products that the customer has no real need for. Improved quality: Perhaps the biggest advantage is that these molds are created with a high attention to detail which means that the final product is of the utmost quality. This in turn improves the strength of the metal by reducing the weakening through overworking the final product.